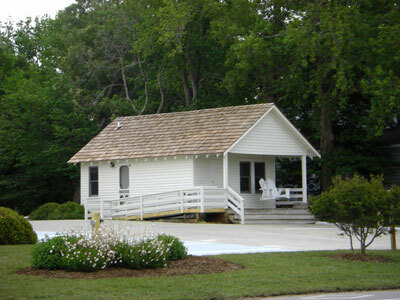 Originally located in Mamie, NC, the post office was moved to Duck village on the Outer Banks in 1989 and used as a retail shop. In 2000, Twiddy & Company moved the post office to its current location where it was restored and now serves as a private office. “It’s important for me to do what I can to preserve the local history,” said Twiddy. “Our children, grandchildren, and visitors deserve to have actual landmarks where they can get first hand appreciation for Corolla’s heritage.” (North Beach Sun article, “Old Corolla Schoolhouse Being Preserved”, Summer, 1999). Arriving guests walk by the old post office on their way in to the main Duck Vacation Rental building as they check-in to their Outer Banks vacation rentals each week.